The application of various allelochemicals in agricultural production is carried out primarily to increase the quantity and quality of crop yield. 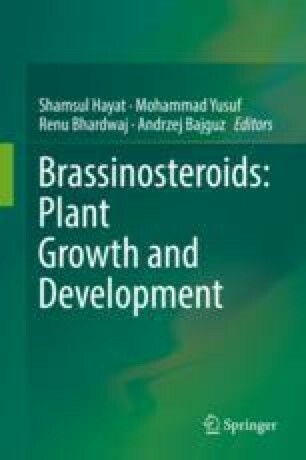 These allelochemicals, which include brasssinosteroids (BRs), can reinforce the resistance of crops to abiotic stresses or increase their competitive ability against other organisms (biotic stresses). In particular, BRs can directly intensify crop physiological processes leading to increased growth and development, which create essential prerequisites for their increased yield. Thus, the use of the BRs in plant protection and agriculture is of particular interest. As yield is the ultimate and most important characteristic related to agricultural production, it represents the end product of transforming matter and energy in plants in the field. In order to obtain better qualitative and quantitative yield results, different crops are often subjected to various concentrations of 24-epibrassinolide (24-EBL). Therefore, this chapter concerns biochemical and biophysical responses of several (maize, soybean, barley etc.) crops treated with a range of concentrations of 24-EBL at various stages of development (seedlings, vegetative stages of plants before flowering and mature field plants). Particular attention is given to the influence of exogenously applied 24-EBL on specified physiological and biochemical parameters (carbohydrates, starch, polyphenols, pigments, proteins, etc.) in selected crops, especially maize, in relation to their likely roles in determining crop biomass accumulation, biomass redistribution, growth, yield and improved resistance to abiotic stresses. This research work was partially supported by the Serbian Ministry of Education, Science and Technological Development under the projects number 172015, TR 37021, TR31080 and TR31018.